I moved my young family from our home in Alaska to Utah in 1983, hoping to obtain a college degree in surveying so I could continue to progress in my surveying career and become “the best party chief that I could ever be.” I soon realized after the move that no such degree program existed within the Utah System of Higher Education (USHE) or within Utah’s major private colleges and universities. Feeling disappointed, perplexed, and confused, I approached the civil engineering and geography departments at Brigham Young University. They helped me create a “designer degree in another discipline closely related to surveying that met my needs. I eventually became a licensed professional land surveyor, surpassing my goal of becoming a great party chief; yet still a standard surveying degree program was not available in Utah. I extended my dream to the young men and women who followed after me in pursuit of surveying education in Utah, that they would somehow have a surveying degree program made available to them. I soon discovered that others in Utah’s professional land surveying community had dreamed the same dream and taken action. 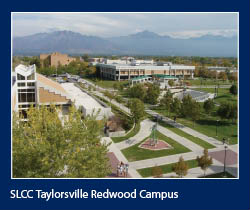 In 1987, the education committee of the Utah Council of Land Surveyors (UCLS), which currently represents about 80% of all professional land surveyors residing in the state, approached Salt Lake Community College (a USHE school) with a proposed joint venture to provide post-secondary surveying education to the people of Utah. The courses in the proposed program were already organized and developed by the UCLS. As part of the program model all surveying faculty members must be degreed, licensed, and experienced professional land surveyors who hailed from the diverse public and private sectors. The college accepted the proposal and initially placed the new two-year Associate of Applied Science (AAS) Surveying Degree program under the continuing education department, where it slowly grew and was moved to where it now resides, in the geosciences department in the SLCC division of natural sciences of the school of science, mathematics, and engineering. The program advisory committee was to be a diverse composite of surveying faculty members (mostly UCLS members) with college administrators, including a full-time surveying faculty member who also serves as the program coordinator. This is the model that’s used today and has proven to be effective and efficient in responding to the needs of the profession, students, the college, and the state of Utah. The courses are flexible and are offered on-site, online, or in web-enhanced classes to best accommodate students. The program is duly recognized and accepted by the Utah state licensing board for professional engineers and professional land surveyors. Give licensed professionals opportunities for upgrade training on new issues and equipment in surveying. Having met an important milestone with the SLCC program in place, the UCLS then worked with the Utah legislature to change the law from the prior “experience only” platform to a new platform mandating the minimum education requirement of a two-year surveying degree as part of the Utah professional licensure process. The new licensure law was passed in 2003, taking full effect as of January 1, 2007. But the UCLS did not stop at the mandated two-year degree! In recognizing the continued need for higher and advanced surveying education in Utah and in order to meet the NCEES challenge and standard, the UCLS approached Southern Utah University with a proposal to develop a four-year degree program in surveying. After a few months the proposal failed. Working through its education committee, the UCLS made contact with Utah Valley University (UVU). Because SLCC and UVU had existing articulation agreements in place for other transfer programs and there are 40 miles separating the two institutions, this was a logical fit for both schools. The UCLS, UVU, and SLCC have been working together for the past four years in the development of the proposed Bachelor of Science degree in Geomatics at UVU, with most of the administrative planning and curriculum development being performed by UVU. At press time the UVU degree program was on the December 2010 agenda of the Utah State Board of Regents for final review and approval. If approved, the BS degree program will be implemented during the 2011 - 2012 academic year effective July 1, 2011. In support of this process, the SLCC program is changing its name from “Surveying” to “Geomatics.” With most of the 69 credit hours in the SLCC program articulating to the UVU program, surveying students wanting to earn a BS degree would be able complete the first two years at SLCC and transfer to UVU. After the UVU BS degree is in place and is in full operation, the UCLS has plans to work again with the Utah state legislature to raise the bar for surveying education in Utah from a minimum two-year surveying degree to a four-year degree to meet the NCEES challenge and standard. As the bar is lifted again, the surveying and geomatics profession is improved and lifted. When I reminisce over the past years since having first dreamed of a surveying degree program in Utah, I’m proud and in awe of all that has been accomplished. So many people united in a common effort and with a shared dream. Men and women have come from all parts of Utah and other areas to perform their roles in making the shared dream a reality. I have respectfully written this column in their honor, to give credit where credit is due, and to thank each of them for a job well done! For more information on the SLCC surveying program visit www.slcc.edu/surveying. Walter M. Cunningham, PLS is the surveying (geomatics) program coordinator and a faculty member at Salt Lake Community College, in Salt Lake City, Utah.